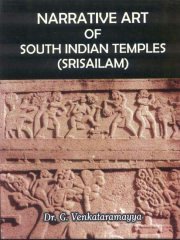 The book mainly focuses attention on a brief review about templestudies in India and in Andhra Pradesh. The significance of Srisailam and its Prakara well Literacy importance are discussed in detail.Besides the sculptures, which represent yoga,tapa,yajna,yaga,poojas, crimes and punishment, procession, dance and Music are widely emphasized. Dr. G. Venkataramayya : Born in 1956 in the village in Andhra Pradesh. He obtained the first Ph.D degree from school of History,Culture and Archaeology, P.S.Telglegu University, Srisailam Campus under the astute guidenceProf. K. Thimma Reddy.He is an expertise in Art and Agriculture, Temple studies.His Interest in people`s culture during Medival Aandhra reflects in the M.Phil and Ph.D degrees awarded under guidence.Under his guidence 1Ph.D and 19 M.Phils are awarded. Presently 7 Ph.Ds and 3 M.Phils are in progress.Now he is also the life member in progessional body of A.P. History Congress.